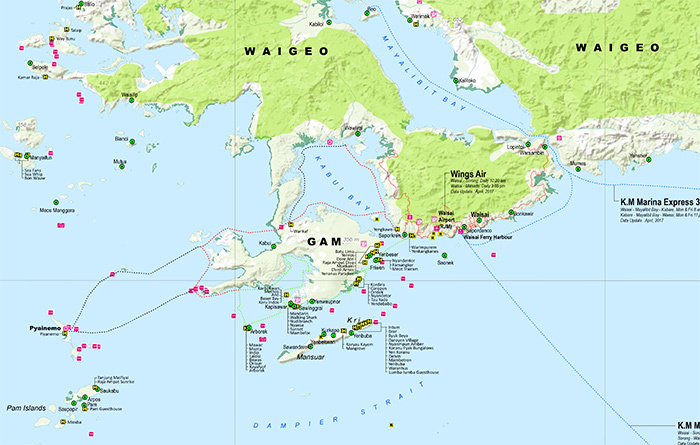 If you’re looking to travel to Raja Ampat, here’s a bunch of maps that will hopefully be of use. If you’re planning independent travel to Raja Ampat, you might also want to see our How to get to Raja Ampat page and step by step guide. A highly detailed map compiled by Yayasan Basudara, this map has it all. Homestays, villages, ferry routes, points of interest, kayaking routes. Be aware that the transport data was current in April 2017 and has probably changed. The Wings Air flights into Waisai definitely have. Fabulous work Fahmy – thank you! Good snorkeling’s available almost everywhere in Raja Ampat, but here’s a selection of Raja Ampat dive sites selected because they have great stuff to see at snorkeling depths. Clicking on the starfish icons will show site name, location and GPS coordinates. For more information (and some video) visit our Snorkeling in Raja Ampat page. To quickly find homestays with excellent snorkeling, select “Coral” and “Good house reef” in the advanced search on the accommodation page. If you’re a diver looking for a comprehensive map of Raja Ampat dive sites, we’d suggest getting hold of Burt Jones and Maurine Shimlock’s book “Diving Indonesia’s Bird’s Head Seascape” – it’s by far the best resource available. Here’s a link to their website. If you are looking for a particular shop or service in Sorong, you might find ukka.co useful. This website is very helpful! This will be the first visit and I’m planning to stay for 2 weeks in Raja Ampat, probably in Southern Gam (Corepen Homestay). I would like to know the transport to get there, as far as I know, I should go from Sorong, right? Will that be a direct boat trip to the island? 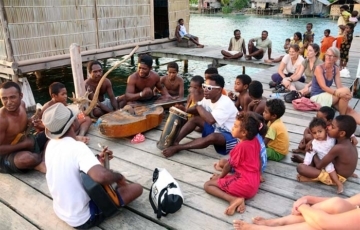 This page explains how to get to Raja Ampat, and our step by step guide has links to all the other information you might need. Raja Ampat Islands please ? What site can I contact for maps to be posted to myself please ? 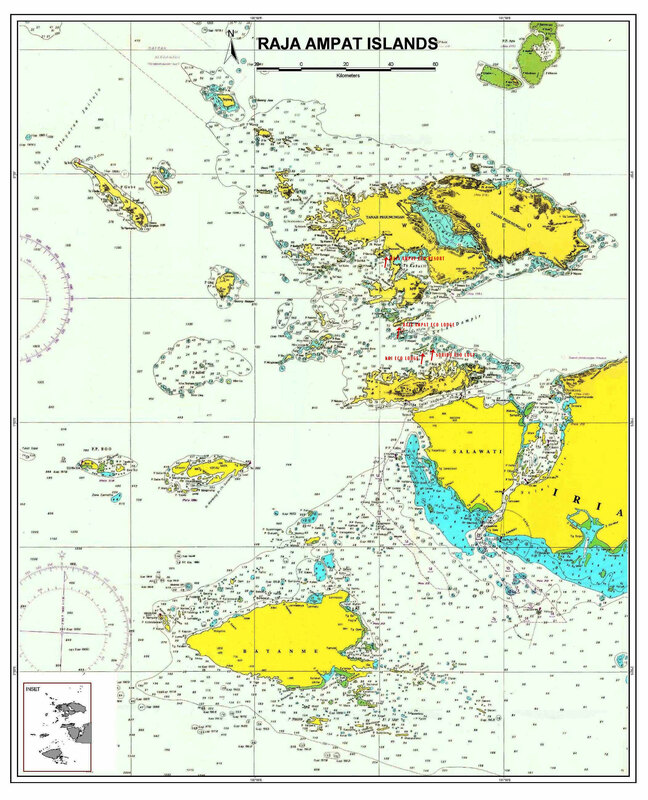 If an A4 map is large enough, you are welcome to download the PDF supplied above and have it printed. 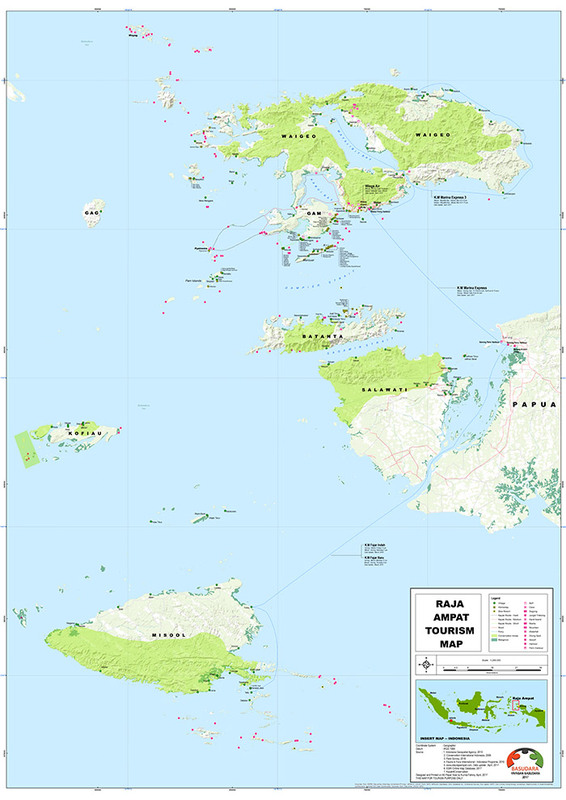 There are many online map suppliers you can order maps from, but we don’t know what Raja Ampat specific maps they might have available. your map of home stays is very detailed and highly appreciated. I was just wondering where exactly is Mongkur Kodon home stay. I haven’t found it on the map. I know it is in southern part of Kri, but would be interested to know the neighboring home stays that can be reached by foot from Mongkur Kodon. 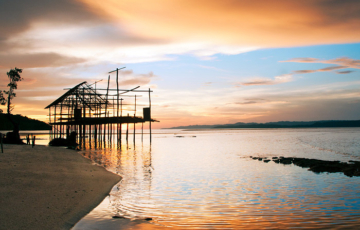 We would like to stay at the beach where Mongkur Kodon is located, but not at this very home stay. Thanks in advance for any hints. Every homestay on the website has a location map near the bottom of its page. If you zoom into Mangkur Kodon’s location map, you will see all the nearby homestays. Thanku sharing in depth detailed info Am planning spend time as volunteer english teacher in Sawinggrai 2016 Need find my own way there on backpackers budget Your info is invaluable, reckon I’ll get there successfully by following it Thx ! Any idea why Indonesia is not supported as of 10/2013 in Google Mapmaker? 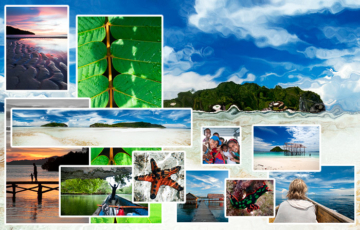 Seems like it would really help to put Raja Ampat on the map – literally – if we were able to add ports, ferries, villages, businesses and other points of interest for inclusion in Google Maps’ own database – not just on our custom maps. NICE! Somebody’s been busy this week! Don’t forget to wedge in a permalink to these somewhere on your Home page.